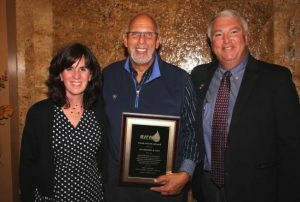 Tata & Howard, Inc., a leading innovator in water, wastewater, and stormwater engineering solutions, is pleased to announce that Paul B. Howard, P.E., Co-Founder and Senior Vice President at the firm, has been recognized with the 2018 Massachusetts Water Works Association (MWWA) Executive Director Award for his distinguished accomplishments and professional achievements in the water environment. The Award was presented at the MWWA Annual Meeting and Awards Banquet on November 1st 2018. 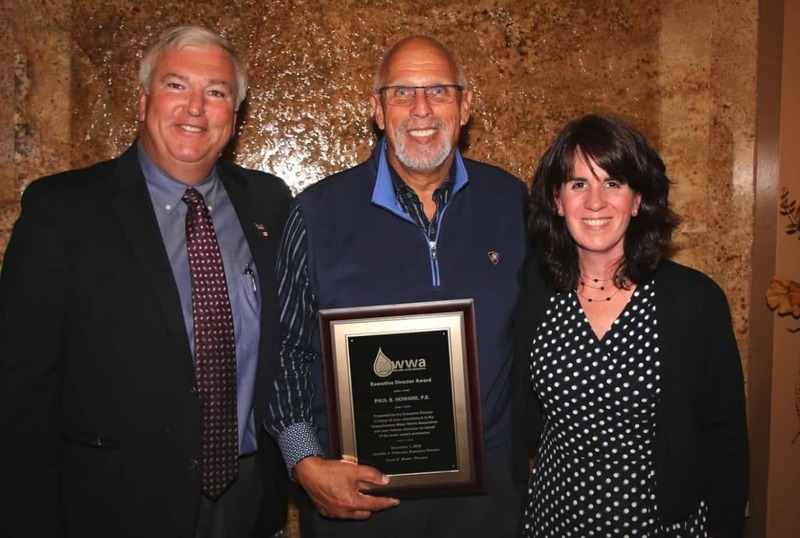 Presented by MWWA Executive Director Jennifer A. Pederson, the Award is in honor of Paul Howard’s commitment to the MWWA and his tireless advocacy on behalf of the water profession. The Award recognizes an active MWWA member whose knowledge and contributions to the profession merit special recognition. Paul B. Howard, P.E. (center), receives his Executive Director Award during the MWWA Annual Meeting and Awards Banquet. Shown with Paul is MWWA President Joe Coulter (l) and MWWA Executive Director Jennifer Pederson (r). Tata & Howard staff joined MWWA President Joe Coulter, and included: Co-Presidents Jenna W. Rzasa, P.E. and Karen L. Gracey, P.E. ; Associate Jon W. Gregory, P.E. ; Founder and Sr. VP Paul B. Howard, P.E. ; and MWWA Board President Elect and Tata & Howard Senior VP Patrick S. O’Neale, P.E. Not pictured, Robert P. Sims, P.E. Karen L. Gracey, P.E. 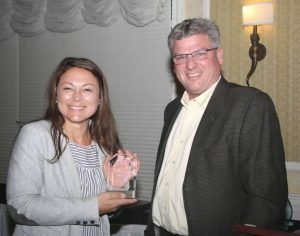 receives the Presidential Sponsorship Award during the MWWA Annual Meeting and Awards Banquet. Along with Paul Howard being honored, the event included awards for Sponsorship, including one for Tata & Howard’s Presidential Sponsorship presented to Co-President Karen L. Gracey, P.E. Introduction of the elected slate of Officers of the Association also took place and included MWWA Board President Elect Patrick S. O’Neale, P.E., a Senior Vice President with Tata & Howard. Photo Credit: Massachusetts Water Works Association.